vi, 162 leaves : ill. ; 29 cm. Includes bibliographical references (leaves 156-161). simulations of the coils they all helped to construct. special thanks for her extensive help preparing the thesis. pursue this work to its conclusion. shielding, and improved use of bore space. designed based on the time-domain performance model. echo removes chemical shift and B0 inhomogeneity effects. remove the eddy current effects in a larger coil set. binary liquid mixtures separating near a critical point. producing and evaluating pulsed field gradients. 1D. G. Cory and A. N. Garroway, Magn. Reson. Med. 14, 435, 1990. 2D. Brihwiler and G. Wagner, J. Magn. Reson. 69, 546, 1986. 3K. K. Kwong et al., Proc. Natl. Acad. Sci. 89, 5675, 1992. 4Z. H. Cho et al., Med. Phys. 15, 815, 1988. 5H. R. Brooker et al., Macn. Reson. Med. 5, 417, 1987.
magnet, and the gradient systems were adapted accordingly. prototype was constructed and tested. a simple amplitude modulator to carry out slice selection. and nonbiological systems were carried out. 6D. G. Cory and A. N. Garroway, Magn. Reson. Med. 14, 435, 1990. 7C. Boesch et al., Magn. Reson. Med. 20, 268, 1991.
current field measurement are reviewed. with longitudinal and transverse relaxation, respectively. Equation  is called a free induction decay (FID). 8R. Turner and R.M. Bowley, J. Phys E: Sci. Instrum. 19, 876, 1986.
much greater conductivity than might otherwise be expected. Edition, CRC Press, Boca Raton, 1991. 11 times greater than it would be at room temperature. 11H. R. Brooker et al., Maan. Reson. Med. 5, 417, 1987.
that is based upon the integral of the eddy current field. those that detect the integral of the eddy current field. 12D. J. Jensen et al., Med. Phys. 14, 859, 1987.
be used effectively to adjust preemphasis compensation. 14Ch. Boesch et al., Magn. Reson. Med. 20, 268, 1991.
enough to obtain a meaningful measurement. proposed later is a single-point acquisition technique. 15R. Turner, Magn. Reson. Imaq. 11, 903, 1993. 16Ch. Boesch et al., Magn. Reson. Med. 20, 268, 1991. 17Ch. Boesch et al., SMRM 1989, 965.
are apparent at the ends of the FIDs. applied with and without the preceding gradient pattern. eliminated by the symmetry of the coil/cylinder system. Only the x and xz terms would appear in an ideal system. from an already compensated system. eddy currents, they use a 4 cm diameter spherical phantom. spherical harmonic expansion of the eddy current field. given; presumably only these terms were shimmed. 18J. J. van Vaals and A. H. Bergman, J. Magn. Reson. 90, 52, 1990. 19J. J. van Vaals et al., SMRM 1989, 183. 20P. Jehenson et al., J. Macrn. Reson. 90, 264, 1990. 21H. Egloff, SMRM 1989, 969. 22W. R. Riddle et al., SMRM 1991, 453.
or they may be artifacts from beginnings and ends of FIDs. measured and the offset frequency of the line determined. unique isocenter for each time constant. 23D. G. Hughes et al., SMRM 1992, 362. 24Y. Zur et al., SMRM 1992, 363.
noise ratio (SNR) distort the phase of the received signal. small bandwidth without significant phase distortion. small values of time and gradients. using a phantom slightly smaller than the imaging volume. 25R. E. Wysong and I. J. Lowe, SMRM 1991, 712. 26M. Keen et al., SMRM 1992, 4029.
obtained from a pickup coil. Magnet Technology whole body superconducting magnet. 27M. R. Teodorescu et al., SMRM 1992, 364. 28W. R. Riddle et al., SMRM 1991, 453. 29M. A. Morich et al., IEEE Trans. Med. Imac. 7, 247, 1988. 30D. J. Jensen et al., Med. Phys. 14, 859, 1987.
may be the most promising of the techniques surveyed. Figure 1. Two-pulse experiment with pulsed field gradient. distortion due to the eddy current field. 31H. R. Brooker et al., Magn. Reson. Med. 5, 417, 1987. 32T. H. Mareci, Personal communication. (TE) 40 = yx E/2 gdt' J/ gdt] = yx2fTE/2 gdt' JTEgdt]. 33M. A. Morich et al., IEEE Trans. Med. Imaq. 7, 247, 1988.
determine Gi for large TE, another experiment was performed. The problem of signal decay due to T2 is thus circumvented. only to obtain a starting point for varying TE. experiment for a series of increasing gradient amplitudes. minimum detectable eddy current field. echo experiment for measurement of the eddy current field. the first T is preserved. integral of the eddy current field over a short interval T.
also be able to decrease sensitivity when needed. macro functions as a command to the Varian program "VNMR"
" Adgrad ( t max) "
portion is not part of the macro. also the center of the FID) for the data already in memory. old by T, to provide for a contiguous series of intervals t.
constant, the next measurement will yield a phase A0 of 45.
than for Adgrad or Adgrad2. of the average field in each of the measurement intervals. D (t) = yx[taA(l e-tta) + tbB(l e-t/tb) + tc( etc)]. echo times via matrix inversion of simultaneous equations. amplifiers were used to drive the coils in current mode. compensation (lower curve). a) X coil; b) Y coil; c) Z coil. curves represent the eddy current field after compensation. gradient field for 4.7 T magnet system before compensation. of the applied field, the error is not severe. curve was acquired after second-pass preemphasis; c) Z coil. terms than the stimulated echo contributing to the signal. current fields that are not simply monotonically decreasing. farther from the region of interest than a Maxwell pair. 34D. J. Jensen et al., Med. Phys. 14, 859, 1987.
gradient coils compared to that for radio frequency coils. for functional imaging of the human brain. 35F. Romeo and D. I. Hoult, Magn. Reson. Med. 1, 44, 1984. 36B. H. Suits and D. E. Wilken, J. Phys. E: Sci. Instrum. 23, 565, 1989.
combining aspects of both continuous and discrete designs. we have chosen to concentrate on the radial case. Figure 11. The coordinate system used in the text. 37R. Turner, J. Phvs. D: ADpp. Phys. 19, L147, 1986.
significantly reduce and distort the gradient field. 38F. Romeo and D. I. Hoult, Magn. Reson. Med. 1, 44, 1984. 39M. J. E. Golay, Rev. Sci. Inst. 29, 313, 1958. 40B. H. Suits and D. E. Wilken, J. Phys. E: Sci. Instrum. 23, 565, 1989.
approaches to meeting those requirements. 41W. A. Anderson, Rev. Sci. Inst. 32, 241, 1961. 42M. J. E. Golay, Rev. Sci. Inst. 29, 313, 1958. 43P. Mansfield and B. Chapman, J. Maan. Reson. 66, 573, 1986. 44W. A. Anderson, Rev. Sci. Inst. 32: 241 1961.
current in the various coils. 45F. Romeo and D. I. Hoult, Maan. Reson. Med. 1, 44, 1984.
number of current elements the procedure becomes unwieldy. radius of about 1/3 that of the cylinder. Maxwell pair produces the axial, or z, field gradient. which the wires were included in two intersecting planes. 46B. H. Suits and D. E. Wilken, J. Phys. E: Sci. Instrum. 23, 565, 1989. 47V. Bangert and P. Mansfield, J. Phys. E: Sci. Instrum. 15, 235, 1982. 48p. Mansfield and I. L. Pykett, J. Macn. Reson. 29, 355, 1978. 49R. Turner and R. M. Bowley, J. Phys. E: Sci. Instrum. 19, 876, 1986.
distribution of current is approximated by discrete wires. 50R. Turner, J. Phvs. D: Appl. Phys. 19, L147, 1986. 51M. Engelsberg et al., J. Phys. D. 21, 1062, 1988.
especially pronounced at the ends of the target cylinder. have extended linearity in the radial and axial directions. than the width of the shoulders. is also simple to include parameters such as coil length. 52E. C. Wong et al., Maan. Reson. Med. 21, 39, 1991.
human head.53 Its overall length was 37 cm, diameter 30 cm. of a conventional coil to move the linear region to the end. 53E. C. Wong et al., SMRM 1992, 105. 54E. 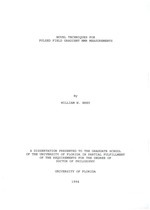 C. Wong and J. S. Hyde, SMRM 1992, 583. 55C. C. Myers and P. B. Roemer, SMRM 1991, 711. 56L. S. Petropoulos et al., SMRM 1992, 4032.
energy for a gradient of 4 G/cm was calculated to be 7.93 J.
field that is potentially dangerous. the torque experienced by an asymmetric gradient coil. 48 cm. The length of both inner and outer coils was 60 cm. diameter of the two radial coils was 27.2 cm and 31.2 cm. the wire pattern, it seems to be about 116 cm. 57L. S. Petropoulos et al., SMRM 1993 1305. 58A. M. Abduljalil et al., SMRM 1993, 1306.
cylinder's axis varied to improve size of the linear region. or angle of the arcs is provided. 59R. Turner, Maan. Reson. Imaa. 11, 903, 1993. 60V. Bangert and P. Mansfield, J. Phys. E.: Sci. Instrum. 15, 235, 1982. 61G. Frese and E. Stetter, U. S. Patent 5,198,769, 1993.
form allows only for current on the surface of a cylinder. tradeoff between maximum gradient and switching time. resistance, Rc, and inductance, Lc, as shown in Figure 14.
change the current through an inductance across the output. series resistor Rc and inductor Lc as shown in Figure 15.
number of turns increases, the area of each turn diminishes. decreasing the size of the wire. the current rises for various N, holding the area constant. linear amplifier coupled to a coil of fixed dimensions. Each curve represents a different number of turns. number of turns for a given switching time. design except for the number of turns. described by the plot of Gmax(to). optimizing the switching performance of a gradient coil. 63R. Turner, Maan. Reson. Imaa. 11, 903, 1993. Let BO(x) be the free-space field from the gradient coil. are not too close together. 68.70/21.30 radial gradient coil is plotted in Figure 17.
shield-to-coil radius of less than about 1.5. V direct current output. The maximum slew rate is 16 V/gs. loads consisting of wire-wound resistors between 1 and 9 Q. The amplifiers were pulsed to saturation at low duty cycle. Measured voltage; b) Calculated current. 65Crown International, Techron 7540, Elkhorn, Illinois. control serves two functions when driving gradient coils. rapidly than the coil's time constant would otherwise allow. current, and the amplifier is unstable and will oscillate. time. Approximately 5 A is being switched into a 7 Q load. be plugged in and out when gradient coils are changed. highly inductive 9 cm field gradient coil. between the NMR microscopy and small-animal spectrometers. remains in the ratio of the coil to the shield diameter. G/cm-A, so the coil has a current efficiency of 15.3 G/cm-A. 66F. Romeo and D. I. Hoult, Maan. Reson. Med. 1, 44, 1984. CRC Press, Boca Raton, 1970, p. 15-29. 68F. E. Terman, Radio Engineers' Handbook, McGraw-Hill, New York, 1943. 69F. Romeo and D.I. Hoult, Maan. Reson. Med. 1, 44, 1984. 70R. Turner, Macn. Reson. Imaq. 11, 903, 1993. 71T. H. Mareci and H. R. Brooker, J. Maan. Reson. 57, 157, 1984.
set following a demand that saturates the amplifier. sectional area, but with varying number of turns. optimal fields obtainable at 200 ps are compared in Table 1.
about 80% of optimum level. Table 1. Gradient fields for 9 cm coil set. windings is predicted to be about 6.7 Q for the inner set. which was measured by the same technique to be about 18 pH. 72R. Bowtell and P. Mansfield, Meas. Sci. Technol. 1, 431, 1990. 73F. E. Terman, Radio Engineers' Handbook, McGraw-Hill, New York, 1943.
current, the switching time is better controlled. shield and RF coil fit together is shown in Figure 22.
matrix by General Electric varnish #7031 diluted in acetone. warm conditions, and the coils were potted in polyester. In order to cool the unit, approximately 25 m of 1/8"
that is capable of producing a pressure head of 40 psi. bubbles in the tubing reveals a flow of about 3.5 cm3/s. CRC Press, Boca Raton, 1970, p. F-34. 75B. H. Suits and D. E. Wilken, J. Phys. E: Sci. Instrum. 23, 565, 1989. 100 gs switching time on X, Y and Z channels. available. These solutions are graphed in Figure 24.
like to make the coil shorter than the 68.70/21.30 solution. efficiency as a function of the position of the return arc. between the z-axis and the current return path. gradient coil. Radius of coil corresponds to 1 on scale. a) YZ plane; b) XY plane. volumes would contain large holes. To avoid these "bubbles"
region of 30.20/66.10 radial gradient coil. 76B. H. Suits and D. E. Wilken, J. Phys. E: Sci. Instrum. 23, 565, 1989.
efficiency of the coil is 0.635/a2 G/cm-A. and maximum gradient are shown in Figure 28.
fields, the 15 cm coil is constructed from split windings. 77R. Bowtell and P. Mansfield, Meas. Sci. Technol. 1, 431, 1990.
switching time at the expense of lower field intensity. coil. A "slower" coil has a larger maximum field. nominal O. D. of 6" (152 mm) and a wall thickness of 1/4"